Take this guide with you to reference later or share with a colleague. Fill out the form and you'll have instant access to the download the .pdf version. A copy will also be emailed to you. There are a lot of commercial bike racks to choose from. But not all bike racks are created equal. 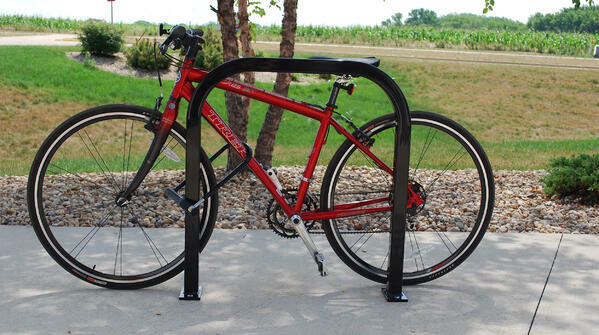 There are key features that make certain types of bike racks better options for securing and properly supporting bicycles than others. In this guide you'll learn what those key features are, other considerations for bike racks, as well as examples of good bike racks, and bike racks to avoid. 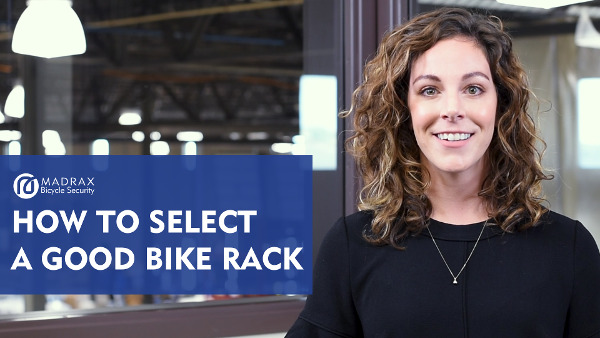 After reading you'll be able to quickly and easily evaluate commercial bike racks and select the best one to meet your bike parking needs. Look for these features in any bike rack you select. Bike racks come in many shapes and sizes. But there are a few common features that a bike rack should have to make bike parking the most secure and accessible. Make sure the bike rack you select meets these criteria. It's important that a bike rack support the frame at least two different spots horizontally. This helps keep the bicycle from falling over. Some racks create two points of contact but are directly above each other. Other racks only allow for one point of contact. This makes it more common for the front wheel to turn and cause the bicycle to fall. This can damage the bicycle and create a hazard when the bicycle is lying on the ground. The rack should also be able to support bicycles without a diamond-shaped frame or a horizontal top tube. Some women’s specific design or step-through frames would be examples. It is quick and very easy to remove the wheels of most bicycles. This is why both the frame and at least one wheel need to be secured to a bike rack. If only the wheel can be locked up, many thieves will remove the frame from the wheel and take the rest of the bike. How a bike rack is mounted to the ground is critical. If a bike rack can be dislodged from the surface it becomes useless. In-ground mounts are the most secure. With this installation method, the bike rack is set in place and concrete is poured. Encasing the legs of the rack in concrete. 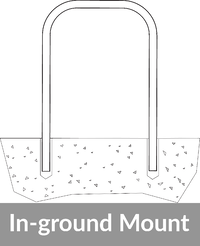 Surface mounts are a good option for racks being installed on existing concrete surfaces. 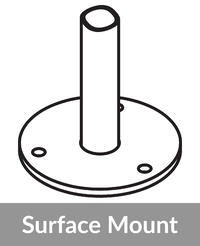 Surface mount bike racks have flange plates with mounting holes. Anchors are inserted in the holes and adhere the rack to an existing concrete pad. This is not a viable option for installing a bike rack on asphalt or pavers. 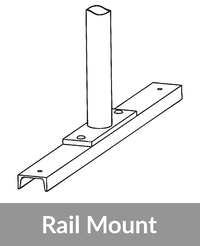 Rail mounts are more suitable solutions for existing surfaces of concrete, asphalt or pavers. Rail mount bike racks have racks bolted to rails. These can then be anchored to the surface or left freestanding. Freestanding racks offer less security. These would be best used where there is additional security. Like fenced-in or actively monitored areas. 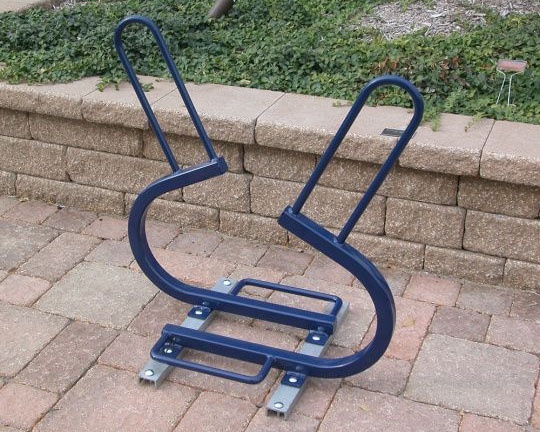 The bike rack itself can be attacked by thieves to access locked bikes. A good bike rack should resist cutting, bending or deformation by common hand tools such as bolt or pipe cutters, wrenches and pry bars. These items are commonly used by thieves as they can easily be carried and concealed under clothes and in bags. To make the rack the most secure, diameter and shape of the tube are the primary factors to consider. 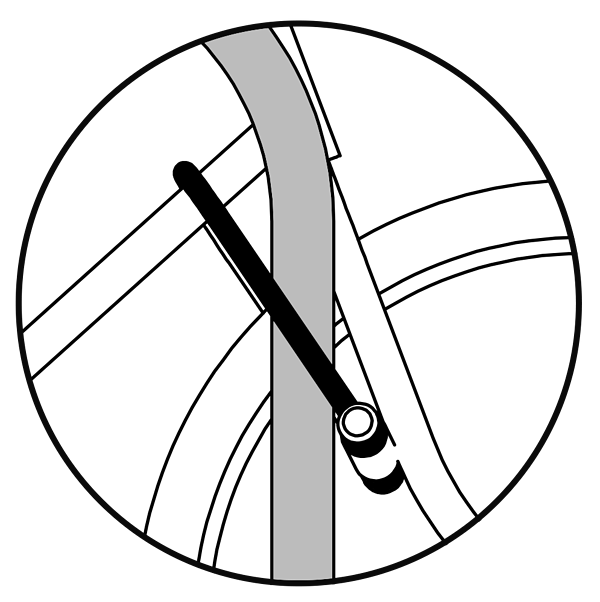 The greater the diameter of tube, the harder it will be to bend or cut. A tube diameter of 2 3/8” is recommended. Minimally, the tube should be 1 7/8” in diameter. A square tube shape will more easily defeat common cutting tools carried by thieves as compared to round tubing. When it comes down to it, a bike rack that properly supports and secures a bike is a beautiful piece art to users of bike racks. But there are options to enhance the aesthetics of a bike rack. 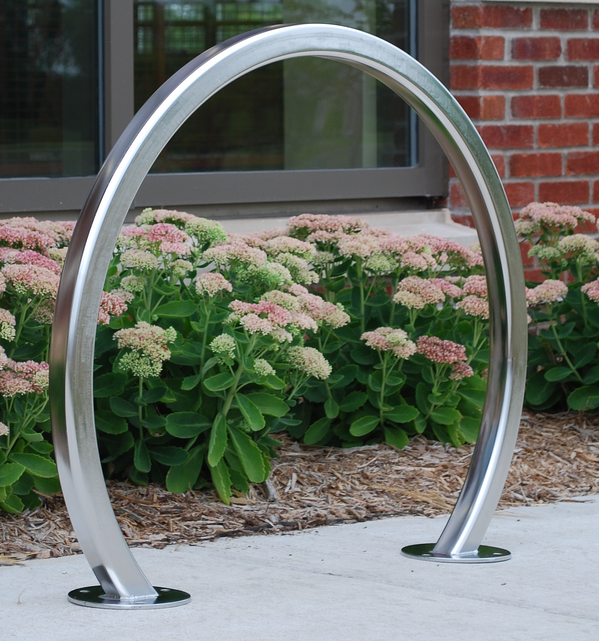 A common choice for bike parking is galvanized steel bike racks. It has a dull, silver/grey color and slight texture. It is also the most durable and maintenance-free option. Stainless steel has a silver/chrome look. It is also has a higher resistance to cutting than galvanized. Stainless will require more upkeep and is the most expensive finish. 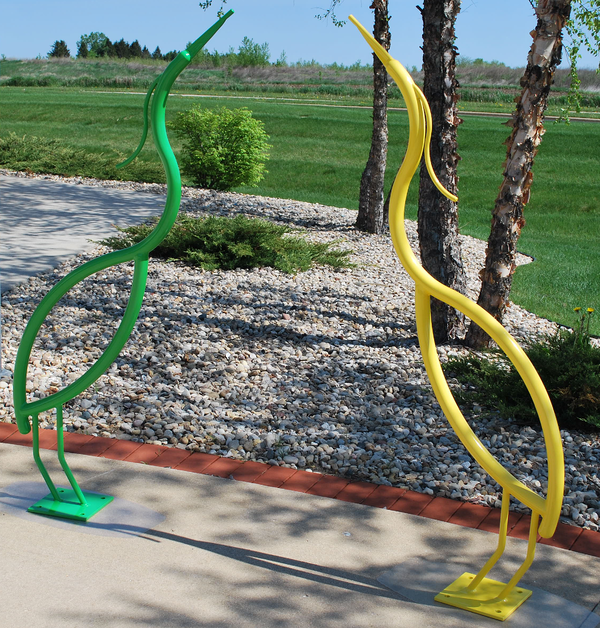 When looking to add a pop of color to a bike rack, you can select from a standard set of powder coat finishes. Custom colors are an option, but typically come at an additional cost. Powder coating will also provide your bike rack with an additional level of protection from the environment. If none of this allows you to express your creativity, there are several customization options for bike racks. From custom lean bars to rings. Or you can have a completely custom bike rack made. 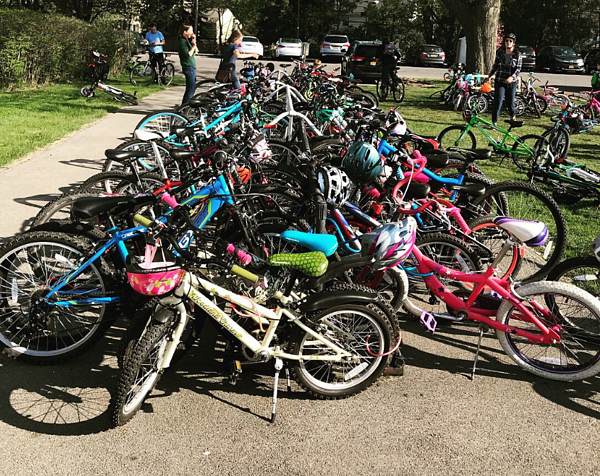 When the elements of a bike rack don’t meet the primary criteria, riders will typically secure their bike in unintended ways to achieve optimal security and stability. This can significantly reduce the number of bikes that can be parked as space on the rack and access to lockable elements is blocked. Additionally, if racks are not spaced properly, bikes are forced to be parked too close together. This causes conflicts where handlebars overlap. This can result in damage to bikes or injury to users as bikes are loaded into and removed from the rack. If it's not apparent the bike rack is for parking bikes, it will go unused. It should also be intuitive for the rider to know how to properly secure their frame and wheel to the rack. 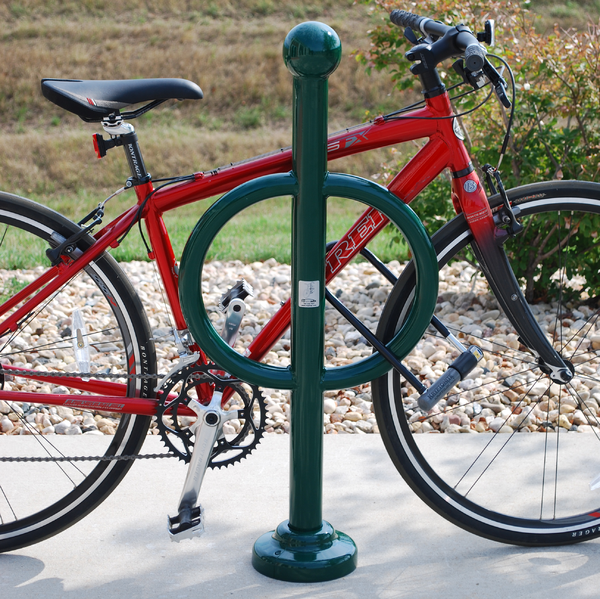 While bike racks that offer two points of contact do a good job of keeping the bicycle upright, wheels can still turn. 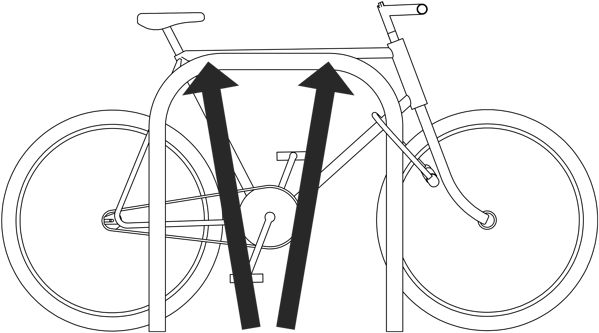 Bike racks that provide a well to hold the wheel AND two points of contact provide much greater stability for the bicycle. 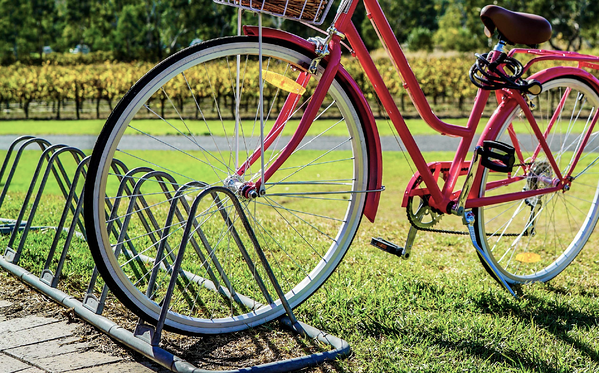 With bike racks that have a wheel well, the two points of contact is a must. When “bike racks” have only a wheel well, it becomes very easy for the wheel to be bent. Aesthetics: Simple design that comes in many finishes. Offered in different shapes and has color, lean bar and shape customization options. Usability and accessibility: Rack is accessible from either side and bikes can be easily secured. Recognizable and intuitive: Common style of ground bike rack makes it easily identifiable and properly used. Aesthetics: Available in different designs and finishes. Custom color, rings and shape options. Recognizable and intuitive: Another style of ground bike rack that makes it easily identifiable and properly used. Aesthetics: Unique shape, available in different designs and finishes. Custom color options. Usability and accessibility: Individual rack accessible from only one side. Racks can be placed to accommodate access from either side. Bikes can easily be secured. Recognizable and intuitive: Reasonably intuitive. Wheel well helps properly park bicycle. The appeal of these bike racks is in the simplicity and relatively low cost. This is where their benefit ends. 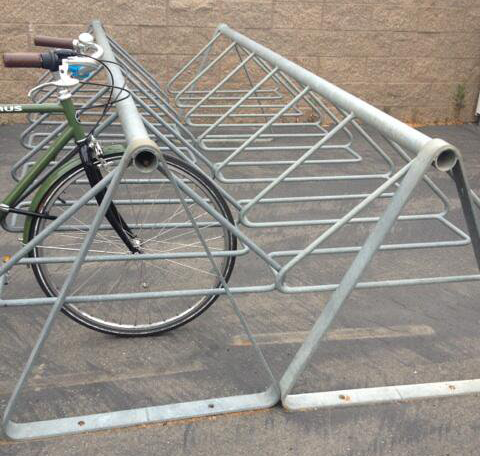 The main problem with these racks is that only the wheel can be secured. Leaving bikes susceptible to theft. The other main concern is the damage they can cause. Bikes in these racks are easily pushed over - inadvertently or not. This leads to bent wheels. Also, the openings are often not wide enough to receive wheels with larger widths, like mountain bikes, and can bend spokes. 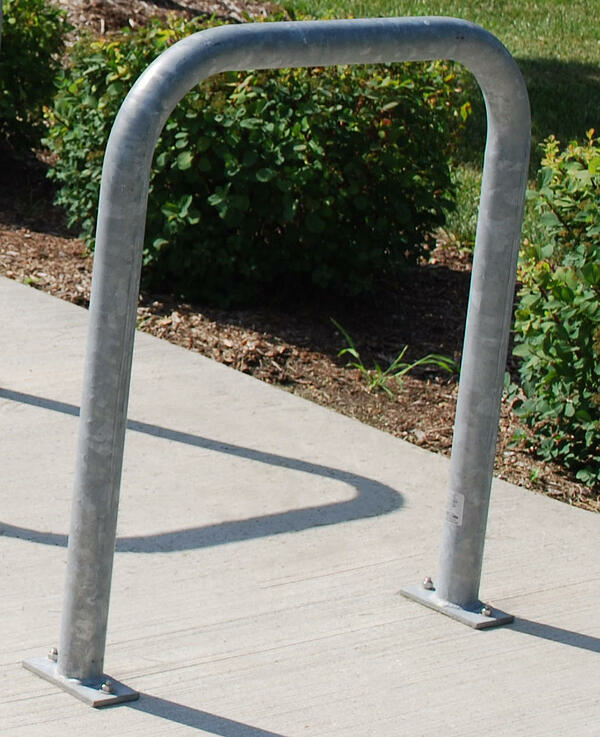 A common style of bike rack found in schoolyards and in front of businesses for their familiarity and perceived capacity for parking many bikes. Like wheel well only, grid-style bike racks share the same problems. When used as designed, it is not possible to secure the frame and wheel to the rack. Bicycles are supported only by the bars of the rack at the wheel. Making it likely that bikes fall over and increasing the possibility of damage to the bike. There’s a reason these racks are often referred to as wheel-benders. The lack of desirable features from grid bike racks typically leads to an additional problem - unintended parking. 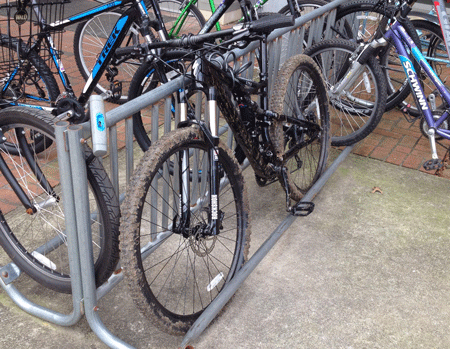 To better support and secure bicycles at these racks, bikes are often parked in unintended ways. The result is fewer bikes can be parked at the rack than what is advertised. Problems with coat hanger bike racks depend on the overall design. Many meet a couple, but not all the criteria to most effectively secure and support bikes. 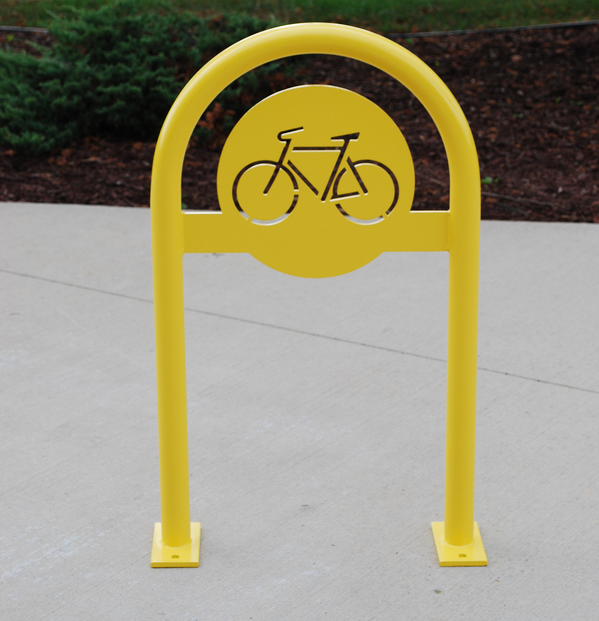 The type of bike rack you select for your business, facility, school/university or city matters. Cyclists will seek out the best option for securing their bikes. And installing bike racks has shown to improve business. Having good bike parking creates a bike-friendly environment. It also enhances and connects your facility to the overall biking infrastructure of your community.